Paul Lambert has resigned as Wycombe Wanderers manager, just three days after their League Two play-off semi-final defeat to Stockport. 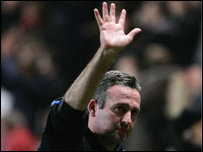 Lambert took over at Adams Park in July 2006, leading the club to the Carling Cup semi-final in his first season. "This is a great club but I feel the time has come for me to move on," the Scotsman, 38, told the club's website. "I am bitterly disappointed that we failed to win promotion but leave with my head held high." The former Scotland international added that he was solely responsible for taking the decision to resign. "I don't have another job to go to, I just feel that it is the right thing to do. "I want to thank the players for their fantastic efforts this season, they are a first class group who worked incredibly hard for me. Wycombe chairman Ivor Beeks said that he was disappointed to see Lambert go. "Paul's done a fantastic job in the short time he's been here but he's made up his mind that he needs to move on and we have to respect that." The club have confirmed that the search for a successor will begin immediately. Lambert's playing career included spells at Celtic and Borussia Dortmund, he also collected 40 caps for Scotland.